Comal County Senior Citizens Foundation is teaming up with the local Home Instead Senior Care to raise funds to help restore the 45-year-old building in New Braunfels. 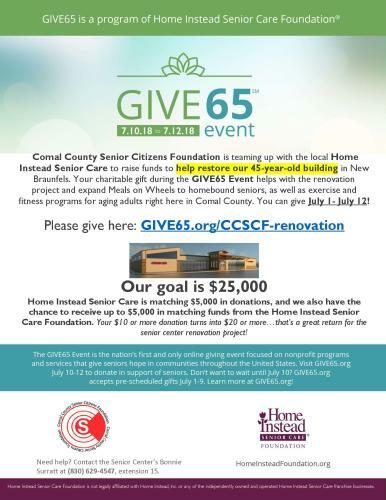 Your charitable gift during the GIVE65 Event helps with the renovation project and expand Meals on Wheels to homebound seniors, as well as exercise and fitness programs for aging adults right here in Comal County. You can give right now through July 12! Home Instead Senior Care is matching $5,000 in donations, and we also have the chance to receive up to $5,000 in matching funds from the Home Instead Senior Care Foundation. Your $10 or more donation turns into $20 or more…that’s a great return for the senior center renovation project! Below is a picture of the building renovation project. Your gift can help make this dream a reality for seniors in our community! To make a contribution to the GIVE65 Event, click here.